PetDoc helps modern veterinary practices simplify appointment requests, reminders, reputation management and more. Built to fit into your existing systems and processes with simple integration, you can be up and running in days without any training. PetDoc’s beauty comes from its simplicity. Designed for pet owners, PetDoc offers them the features they want without clutter or complication. Today’s mobile generation is used to moving quickly and efficiently. Mobile apps have to be simple and easy to use or clients won’t use them. Easy to create reminders for vaccines, check ups, and medication refills. Decrease phone time required for confirmations and reminders. Increase reviews on google and yelp. 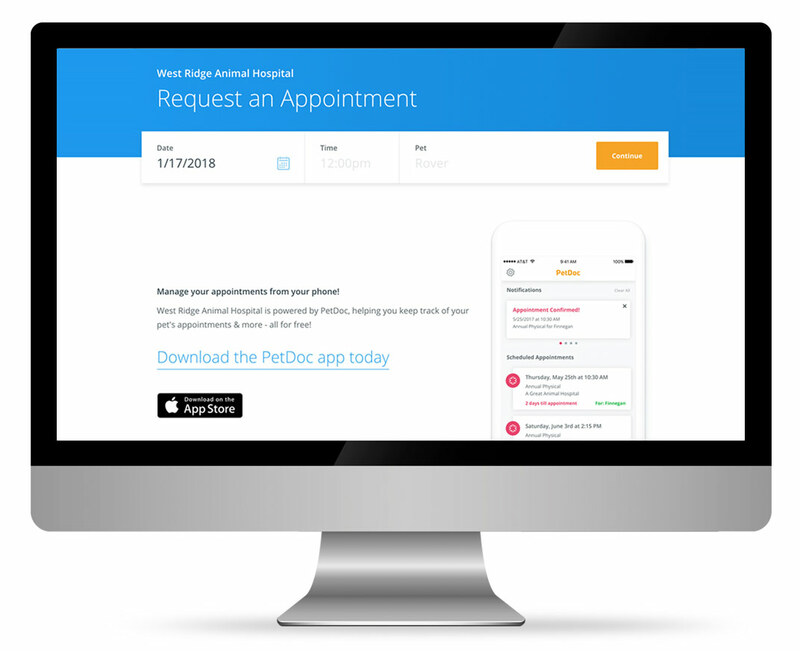 PetDoc provides a specialized microsite that allows appointment request to be made through your website and managed through the PetDoc app. Reduce the burden of having to check your email or website for appointment requests. Client receive confirmation of their appointment requests directly to their phones, and the app reminds them when the appointment is approaching.